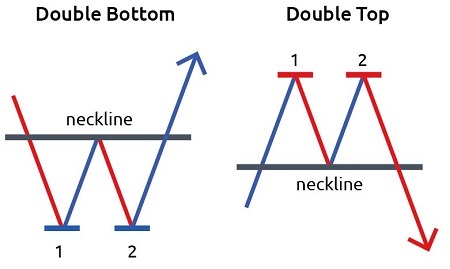 One pattern of price movements that is popular and often occurs in reality is the Double Top pattern and the Double Bottom pattern. This proves that market price movement patterns can be repeated and not always random. Double Bottom pattern and Double Top pattern illustrate market players' sentiment towards a range of price levels considered extreme. That is, the Buyers will look for extreme low points to start buying, or the Seller stakes the highest point to sell. The theory sounds easy, but we must first explore why the Double Bottom or Double Top price patterns appear on the chart, and how to prepare a trading plan once the two price patterns are formed. First, from observing price movements on the chart, you can find price patterns with a display like the letters "M" or "W". At first glance, price patterns like that often occur in a variety of Major Pairs at low or high timeframes. Simply put, price movements such as the letter "M" represent the Double Top price pattern because of its characteristic at both peaks. Whereas when the price forms the letter "W", that means you have found a Double Top price pattern. It's not hard to find it, right? Second, we need to understand that for traders with technical analysis disciplines, the real market does not move randomly. They assume that prices have a tendency to form certain price patterns repeatedly. From the explanation above, the Double Top pattern highlights how prices form two peaks with almost the same height. That is, the market has tried to push prices up, but it turns out repeatedly "notok" at the highest price level, then the price drops back from that peak. Conversely, the Double Bottom pattern displays the Seller's effort to reduce prices, but repeatedly also finds strong defenses at the lowest price level. So prices look back to form a valley in that price range. Now the question: if it's easy to recognize and often appears, actually when do these two price patterns provide accurate trading signals? These are questions that need to be underlined by novice traders. The answer will be explored in the next section on trading. After understanding the basic formation and understanding, we will now learn to prepare a trading plan when a Double Top pattern or Double Bottom pattern is formed. Answering the previous question, even though these two price patterns appear relatively frequently on the chart, it does not mean that every time a pattern is formed you must open a trading position. The quality of the signal accuracy of the Double Bottom or Double Top pattern lies in its position relative to previous price movements. That is, you must pay attention to the location of important Support and Resistance on the chart, to aim at when the two price patterns have the potential to produce accurate trading signals. Important resistance levels are usually drawn from the highest price movements in some past periods, for example a few weeks on the Daily timeframe, or a few days on the Hourly timeframe. Likewise with Support, drawn from the lowest price for the last few candles. Generally, the higher the timeframe, the higher the signal accuracy. So for beginners, it is recommended to use the Hourly or Daily timeframe to get the best signal. Let's peel the way to arrange a Trading Plan based on the appearance of Double Top and Double Bottom patterns. The first peak (Top # 1) on the chart above (USD / CAD, H4) indicates the Buyer's inability to push the price higher than the red dotted line (Resistance). From the first peak, the price climbed again, but again "notok" to form the second peak. If you dare to take risks, do Sell Sell once the price seems unable to climb on the second peak (Top # 2). Prepare a Stop Loss above High candlestick (the highest price value) to limit losses, if the price turns out to even skyrocket. 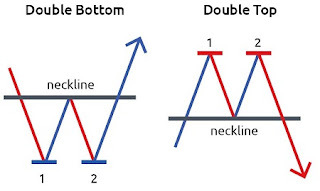 To get a more accurate trading signal, wait until the price closes below the neckline of the Double Top pattern. Cancel the Short position if the candle is still unable to close below that line. That means, the market has not been able to plunge deeper, and Bearish signals are still Invalid. Basically the same as facing the Double Top pattern, the difference lies only in the price projection, and the placement of Stop Loss and Target only. You can just execute a Buy order when the price seems unable to decline again from the second niche (Bottom # 2). Prepare Stop Loss under Low candlestick (lowest price value). Alternatively, wait until the Bullish candle closes above the neckline. If reached, execute Buy orders with Stop Loss in the last Swing Low range. Meanwhile, Take Profit can be adjusted with the Risk Ratio and Rewards. Not satisfied with just written material? Calm down, this time there is a video tutorial on how to trade Double Bottom and Double Top patterns from one of the SF analysts.